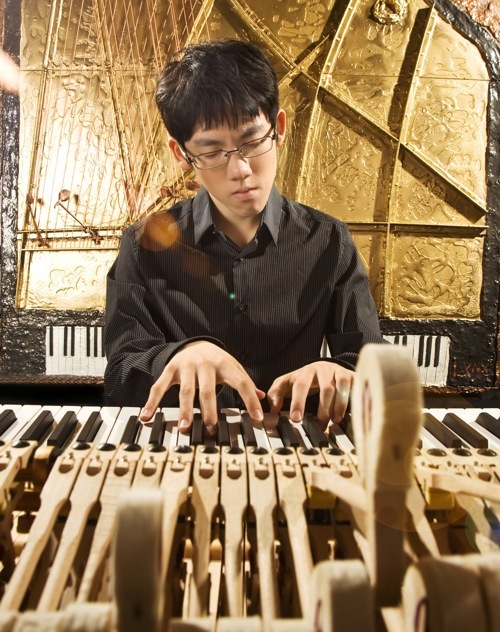 A hugely talented young winner of the Van Cliburn piano competition wowed an East Bay audience last Sunday at the Lesher Center for the Arts. It also offered a joyous remembrance of Cliburn, who died on Wednesday, Feb. 27 and whose memorial service was held that same Sunday, March 3. The 22-year-old pianist, Haochen Zhang, gave a truly memorable performance that translated the searing passions of two hundred years ago, framed with immediacy and maturity. Donato Cabrera returned to lead the California Symphony in a program of three diverse works that were tied together by their explosive energy. Afterwards, members of the orchestra laughingly commented on their intense workout. The California Symphony is currently undergoing a two-year search for a new conductor and artistic director. Just as the Berkeley Symphony’s search engaged a wider audience and resulted in the acquisition of the fearless young Joana Carneiro, there has been much interest and high hopes for the California Symphony. Cabrera, the talented resident conductor of the San Francisco Symphony, led them last year in a spectacular program of Beethoven’s 9th Symphony and Tchaikovsky’s Violin Concerto, two massive works of the literature, respectively starring the SF State Symphony Chorus and Canadian violinist Lara St John. Before Zhang took the stage they set the evening’s lively tone with John Adams’ Lollapalooza, a work that Adams’ himself described as “a dancing behemoth.” But that hardly does it justice. In the hands of these expert musicians, this big-boned collage of overlapping rhythms was a lurching festival of overweight joy. Pianist Marc Shapiro lifted himself off the bench with the force of his bass attacks, inspired by improbably hip bassoons and insouciant clarinets. Cabrera was a treat to watch as he not only danced, but fielded rhythmic complexities and awkward entrances with tight concentration. And when the brass entered we were treated to a moment that was as huge as it was shapely. An intimate moment with piano, shekeree and marimba slurred down to French horn “minimalismas” and then rebuilt from the bottom up, layered and deeply visceral. And after that breathless celebration, genius. Beethoven’s Piano Concerto No. 4 opens with a soft chord and repeated note. I have seldom heard that piano opening so deeply personal, and all accomplished in a few seconds. Zhang was reverential, self-referential, inspired, and the orchestra responded with the fullness and softness of dawn. As they built to rich accords, they retained enormous control, architectural scale and breadth of dynamics. Cabrera not only helped them to shine with deftly shaped phrases, but attended to every subtlety of the pianist. In the cadenzas, Zhang blossomed into a rainfall of fire drops, but with a liquidity that gave an overall ease to his tapestry. Cabrera had to wait for the applause to die down before continuing on to the second movement, where dense string moments interleaved with a suddenly shy piano for a dramatic dichotomy. Zhang finally built into oddly disjoint trills and then filled the finale with full-throated cadenzas. It wasn’t all genius. There were moments when themes were belabored, undercutting their subtlety. But it was far more convincing than anyone had a right to expect. … and then spooning on the sauce. After intermission, they offered Sergei Prokofiev’s Symphony No. 5, a work that offers both thrills and risks. Written after he returned to Russia after 18 years abroad (primarily in France), Prokofiev was taxed by years of fear under Stalin and his watchdog, Zhdanov, who denounced Prokofiev as “formalist,” a euphemism for the sophisticated arts of the West. When he wrote his Fifth Symphony he was trying to crawl back into the good graces of the State, and described his work as “a symphony about the spirit of man.” Its form is complex to the point of confusing, weaving noble truths into something less than their parts. The California Symphony shone in the fun-loving second movement—with a special hats-off to clarinetists Bill Kalinkos and Diane Maltester—and was hugely dramatic in the Adagio and Finale, but something was lacking, possibly through no fault of their own. If you are intrigued by this contest of conductors, Robert Treviño will lead the Symphony in another fine program on Saturday, May 4 at 7:30 p.m. and Sunday, May 5 at 4:00 p.m. at the Lesher Center for the Performing Arts, in downtown Walnut Creek. Violinist Caroline Goulding promises to sizzle! More information and tickets available at www.californiasymphony.org.